Istanbul! What can I say? It’s always held a special draw for me. I can’t exactly explain why, but I’ve always perceived it as mysterious, beautiful, and exotic. We decided to take the kids and visit Istanbul for just under a week before going to Jordan and Israel. I’m so glad we made this decision. Of all the destinations we visited, Istanbul is definitely one of our favorites. The people are friendly and the city is so unique. Below is our new best friend. I don’t remember his name, but he was very warm and helpful as we tried to find…(yes, you guessed it) an Indian restaurant. We later return to dine in his restaurant, and he treated us like we were family. We especially loved the culture and history. Dating back to when Istanbul was Constantinople, the city is rich in history, offering exciting depths to explore and learn about. It was exciting to visit a place whose historical name we all recognized. Throw in a few other familiar words like “Ottoman” and “Byzantine”, and the kids were hooked! Even some of the well-known architecture was familiar to the kids. In fact, they had drawn a picture of the famed Hagia Sofia many years ago, and recognized it immediately when we walked by. 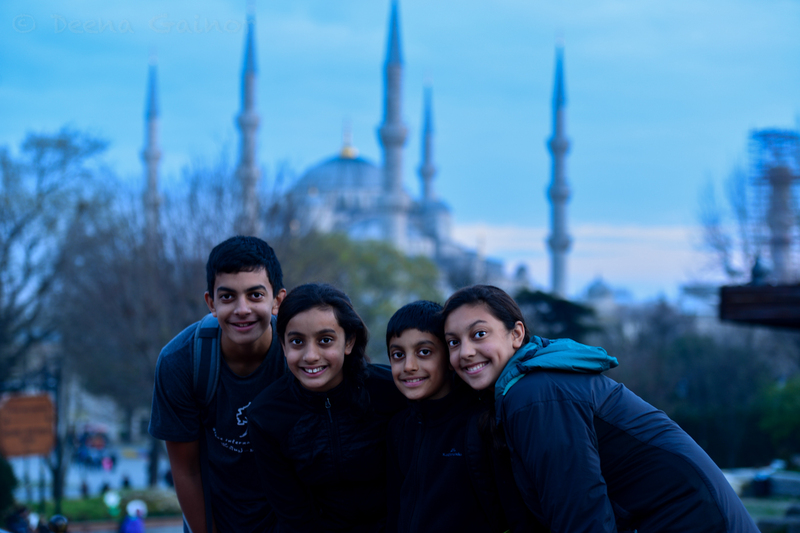 Below is a photo of the kids in front of the Blue Mosque, which faces the Hagia Sophia. Now I have to admit, history doesn’t always excite the kids, especially when it comes to the boys. If they had a chance to explore the Sydney Opera House or the Louvre versus tossing a football in the park or playing guitar, I guarantee you, most times they would choose the latter. This time, however, it was really neat to see them get excited about the Hagia Sophia. It was history coming alive for them! Here we are with our tour guide, Arzu, who helped us learn so much more than we had ever studied before! My travel agent friend and colleague, Heather, connected the two of us and we are so thankful she did. We had a chance to go through the Hagia Sophia and were surprised to learn all that we did. The Hagia Sophia, which means “Holy Wisdom” has such a dramatic history. First built as a Cathedral by the much opposed Justinian, it was then converted into an Islamic Mosque when the Byzantine Empire fell many years later and Constantinople fell to the Ottoman Empire. As is the custom, four minarets were added to the Cathedral and all of the religious mosaics were covered up and replaced. In 1934, the Turkish Government turned the Hagia Sophia into a museum and are still working on uncovering much of what was hidden beneath layers of paint. Today when you visit, you are able to view a surprising combination of Islamic and Christian relics and mosaics. The work still continues today, as much of what was covered over has to be restored in a painstakingly slow manner to avoid damage. 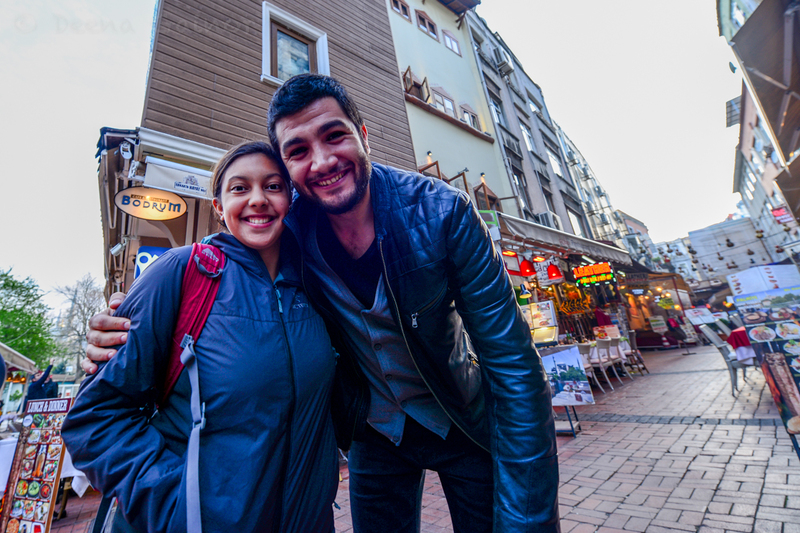 There is so much more to Istanbul, but I’ll continue in a separate blog post. Look for Spices, Turkish Delights, and Baklava – Istanbul, coming soon.